McCall pattern #1007, published in 1942, makes a clown about 14" tall, in two variations, and a donkey about 6.5" tall. There has been some debate among vintage cloth doll collectors as to whether this pattern was designed by Edith Flack Ackley. Those who feel it was not, say that she put her name on everything she designed, and her name is not on this one. 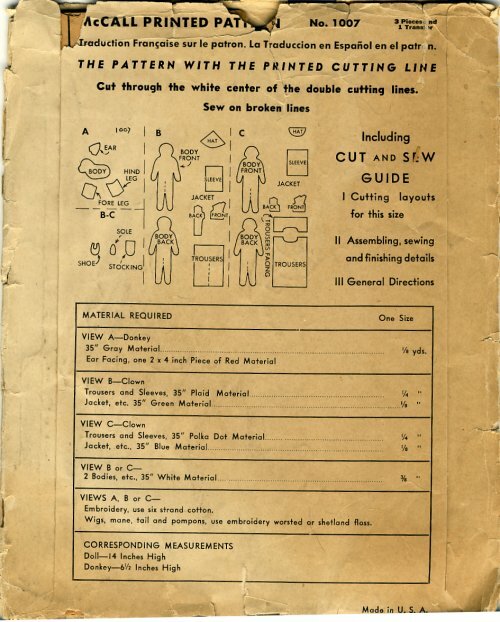 Those who feel it is her design point to the fact that the clown pattern is virtually identical to the one in her book, "Dolls to Make For Fun and Profit," published in 1938. 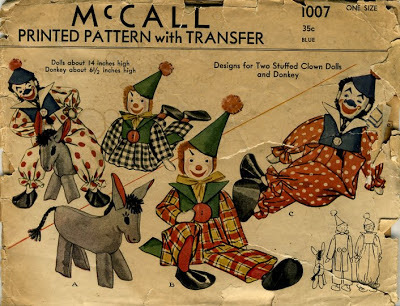 It may be that her name is not on the pattern because she designed the clown but not the donkey; or it may be that McCall purchased the right to her design, but didn't credit her because of changes they made; or it may be that they copied her design, without feeling the need to credit her. If you have an opinion on this, or any further information, please feel free to leave a comment. The clown is a pancake doll, double stitched across his shoulders, elbows, hips and knees to create joints. Both clown and donkey have embroidered features, with a transfer included for the embroidery. 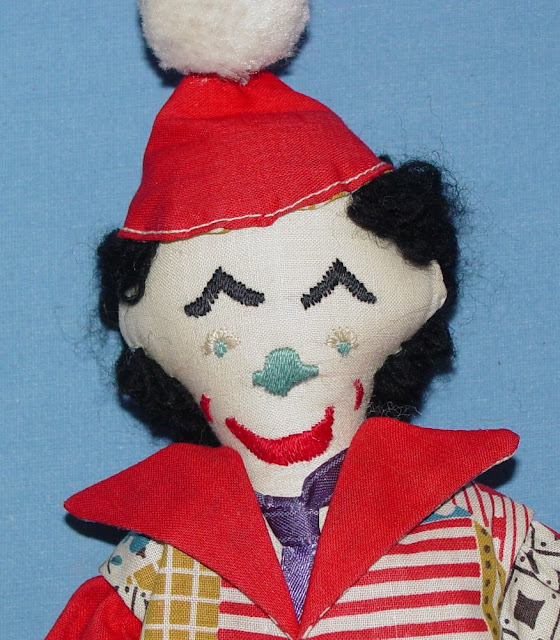 The clown's hair is made by sewing loops of wool yarn to his head. For one of the clowns, you make short loops and leave the top of his head bald. The illustration makes it looks like he has ears; but it's just the way the hair is sewn on (see the photo below). The other clown has longer loops, all over his head, which are then clipped shorter. The donkey has a yarn mane and braided tail. The clown's costume consists of separate trousers and a jacket which is made to look like a shirt and vest. The two costumes are similar but not identical. The jackets are made to be removable, but the trousers are stitched to his body. The shoes may be made from leather, oilcloth or felt, and they are stitched to his feet. A scrap of ribbon makes his tie. The doll shown below is beautifully made. He is not marked or tagged in any way. He was purchased at a doll show in New Jersey.